I love the subtle creamy flavour of coconut milk mixed with the tang of kaffir lime leaves in Thai curries, so I thought recreating this pairing in a ramen would make a nice light broth for springtime. It would be perfect for the Easter period, after having had a big roast on Easter Sunday. Lime leaves are available in most supermarkets in the oriental section. If you can’t find white miso, any brown miso will work too- it is just that the white miso has a lighter, purer flavour perfect for this recipe. Please note: As I don’t drink alcohol and enjoy drinking different teas with oriental meals, I am now adding a tea which I have chosen to drink with each ramen dish, as well as where I bought them from. 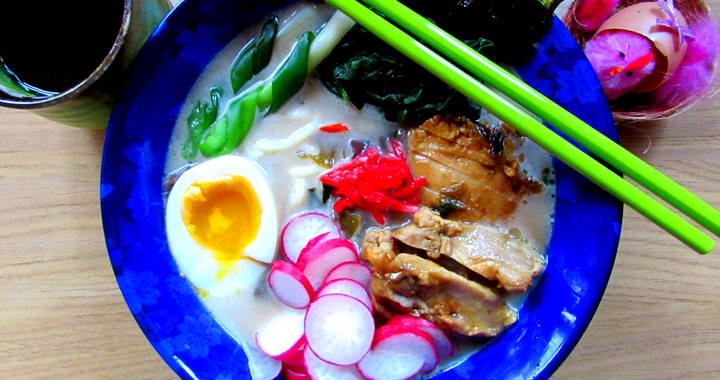 To accompany: Oolong berry tea (from T2) is a perfect spring flavour to serve alongside this spring inspired ramen. The delicate raspberry flavour of this green tea adds a sweetness which accompanies the tanginess of the ramen perfectly. Heat the dashi stock in a large wok or saucepan on a high heat. Add the white miso to 500ml of hot water and mix until the miso is dissolved, then add the coconut milk. Rehydrate the wood war mushrooms and wakame in boiling water for about ten minutes. Cut up the wakame into small pieces if very large. When the dashi is boiling, turn the heat down and add the miso liquid. Stir to mix and then add the wakame, lime leaves, wood ear mushrooms, chilli, garlic and ginger and allow these to cook in the broth for five minutes. Add the tamarind, light soy, rice wine and some white pepper and then taste for flavour. If it isn’t salty enough, add a little more soy sauce. If it isn’t quite tangy enough, add a little more tamarind. Keep the broth warm while you prepare everything else. Trim the spring onion, leaving a portion of the green part. Blanch these and the spinach in salted water for a few minutes and then drain and run the spring onion under cold water. You can leave them like this if you want, but I folded them in half and wrapped the green part of the spring onion around the white to make a little wrapped up spring onion. Top and tail the radishes and then slice them finely. Heat the ramen noodles as per pack instructions, then drain and divide between two bowls. Ladle over the hot broth and then add the toppings around the bowl, putting a little mound of red ginger in the middle and propping up two sheets of nori against the side of each bowl. Posted in Ramen Dishes, Recipes and tagged Chicken, Coconut Milk, Ramen, Spring, Tamarind.